I made a dress. And I took my picture and will let you see my face. These are big steps. Admittedly, I’m a little nervous. This is the first dress I have sewn. Maybe I made a dress when I was a kid, but I don’t remember it so it doesn’t count. My friend Thewallina helped me decipher the pattern from BurdaStyle Magazine, and I pieced it together on my own. It was simple and satisfying, the prefect project. I bought this fabric for 100 yen a meter in Fabric Town, so I felt OK just going for it — no practice muslins for this girl. I misaligned the stripes because I like it that way, and when you sew your own clothes you can do whatever you want! If I make this dress again, I’ll omit the pockets because honestly, they’re useless. I made this dress a few weeks ago and have been saving it for the right occasion. I finally got tired of waiting and wore it to the supermarket. It was a really hot day, and this dress was cool and breezy. I realize these are the key characteristics of a muumuu, and this dress might actually resemble one if you look closely enough, but that doesn’t matter because I made it. So all you naysayers, back away slowly. Because I made a dress, and then I wore it in public. 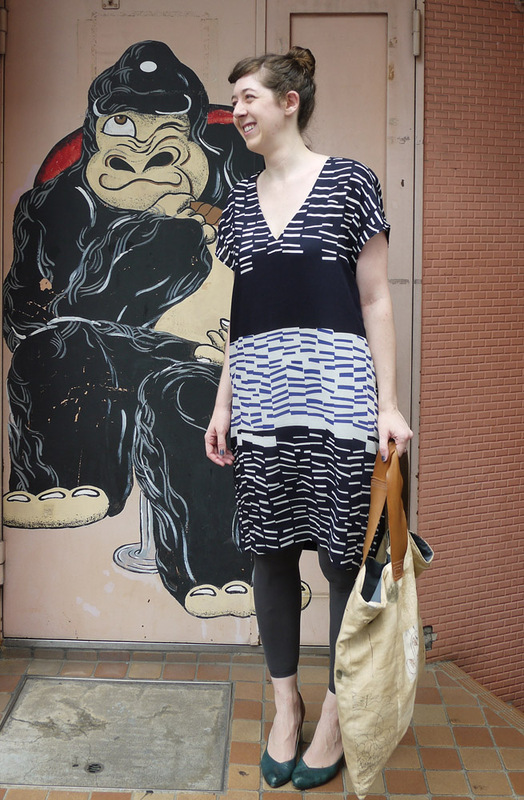 This entry was posted in Crafts and tagged BurdaStyle, DIY, first dress, Japan, muumuu, sew a dress, style. Bookmark the permalink. Absolutely freaking adorable. No WAY is that a first dress. It looks nothing like a muumu and all like a feature presentation in those adorable Japanese sewing books. I just love the fabric and love even more how you used the different patterns in layers in such a creative way. Awesome. Now I totally want to copy you and make the same dress. However, I have a feeling that one needs to be model tall like you to have the same effect. Congrats on the dress – congrats on the perfect photo shoot – and just – YAY YOU!!! ps – It’s trick photography. Anyone would look good standing next to a gorilla! Keep up the great work! I need to actually DO the awesome kit I won from you… I’ve been putting off step 1 for far too long! WOW Amazing! 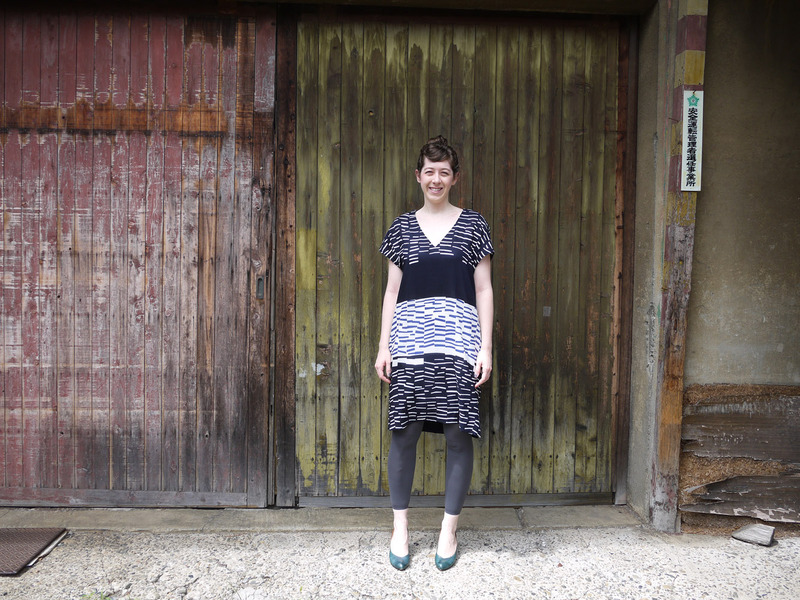 You’ve got a great eye for fabric: it’s modern yet so Japanese, don’t you think? Well done for putting this dress together! Let’s do more dress-making! It is a lovely dress and it looks very nice on you. I sew my own dresses, usually the pattern is very simple but I try to chose great fabrics, like the one that you used. I LOVE your dress! Bravo for you! It’s beautiful and you are beautiful wearing it! Your dress is completely lovely. 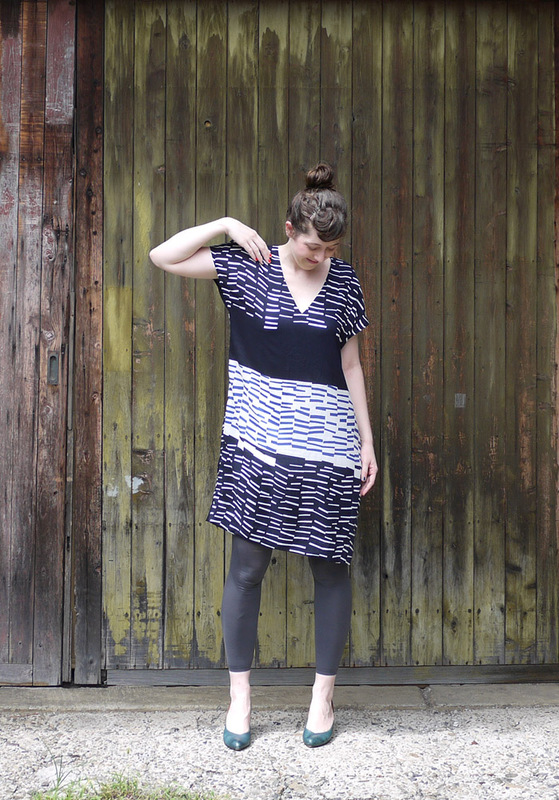 Yay you for making your first dress and for wearing that first dress out & about and on the internet. I love your choice of fabric too. I’m guessing it has the wide stripes off the bolt? Ang, you are so talented! And beautiful! Congratulations on your first dress! Super Dress, it looks great on you. I love the shape, by any chance Do you remember which burda magazine (month) you took the pattern from? Thanks Marcela! I think the pattern was from the 07/2012 issue.